Students are wrapping up their work with weight, so it’s time for another challenge! Their mission is to create an interesting object weighing exactly 40 grams, using 10 grams each of four different materials: polystyrene (Styrofoam), aluminum foil, plastic modeling clay, and wood. As they design and construct their objects, students practice measuring, become more familiar with grams, and see that the weight of an object depends both on size and materials. They get hands–on experience with some materials that are heavy for their size and others that are light for their size. 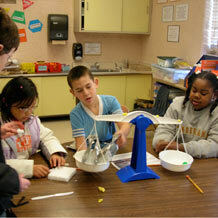 They also use what they’ve learned about the additive nature of weight. By the end of the investigation, students will have revisited many concepts and skills from the unit and will have something interesting to show for it. Introduce “The 10-10-10-10 Challenge,” which is described in the science notebook. Let students know that the objects they create can be anything they can imagine, so long as they use 10 grams of each of the materials. 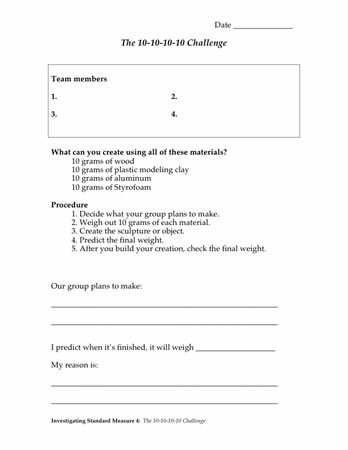 Introduce the materials and ask for volunteers to show, using their hands, how much space they think 10 grams of plastic modeling clay will take up. What about 10 grams of Styrofoam? What about 10 grams of aluminum foil? And 10 grams of wooden stirrers? Let them know they will soon know the answers, because their first job will be to weigh out 10 grams of each material. For this challenge you’ll need to wear more than one hat. Both your engineer and scientist hats are important because you have just four materials to work with and you’ll want to think carefully about their properties so you can make a plan and then build something that works the way you want it to. 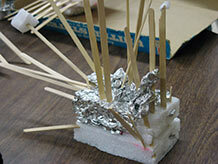 What are some things that aluminum foil can do better than Styrofoam, wood stirrers, or plasticine? What can Styrofoam do better than the other three materials? Think about each material this way, so you make good use of the materials you have to work with. Also, both scientists and engineers often need to do the careful weighing and measuring that you’ll need to do today. And you’ll want to wear your artist hat, to help you be creative and build an interesting object. Engineers often work together with other engineers, with scientists, and with artists and architects. The designs we develop are best when team members listen carefully and consider the ideas of others. This is a great problem to solve, there are many different good solutions, and I’m sure you will enjoy it. After reading the letter, have students brainstorm some ideas about material properties and their potential uses. Reinforce the Engineer’s advice to listen carefully to and consider the ideas of others. Explain that careful weighing and measuring are important to this challenge, and so is team cooperation. Encourage the teams to brainstorm among themselves how best to use the four materials they will be given so they can to create a cool new object. Allow time for students to record their plan and design in their notebooks before distributing materials. Also encourage them to decide together how they will share the work. Technical tip: Pan balances come in two types: with seated pans or with suspended pans. Seated pans are better for this investigation because the straps or chains used to suspend the pans can get in the way of larger objects that students try to weigh. 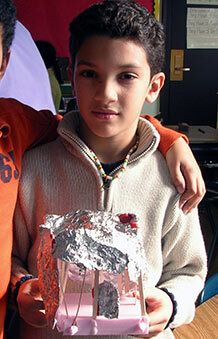 These students are finding that aluminum foil weighs a lot less than they thought. Pass out the materials, and remind students that their first job is to measure out exactly 10 grams of each. Circulate among the teams as they do this, encouraging careful measurement, confirming the weights and answering questions. Notice whether children are comfortable breaking their 10 grams of material into a collection of smaller pieces and whether they know how much their whole object will weigh when they are done. Do they understand the additive nature of weight? The challenge should be deliberate, exacting, cooperative, creative — and fun. Encourage imagination, play, and careful measurement. Teaching Tip: Children may be surprised that the volume of 10 grams of material is so much greater for one material than another. Encourage them to explain why this might be so. Are they beginning to recognize the properties “light for size” and “heavy for size”? A seated pan balance accommodates larger objects more readily than a balance with suspended pans. As teams complete their constructions, have them take them to an official weighing station to determine the weight. Is it 40 grams? If not, why not? Is there material missing? (Check the floor and chairs of the work areas.) 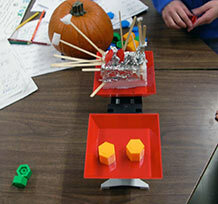 Did the students use the entire allotment of materials without first measuring out 10 grams of each? 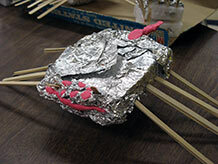 Allow students to make adjustments so that they have a construction that weighs 40 grams. 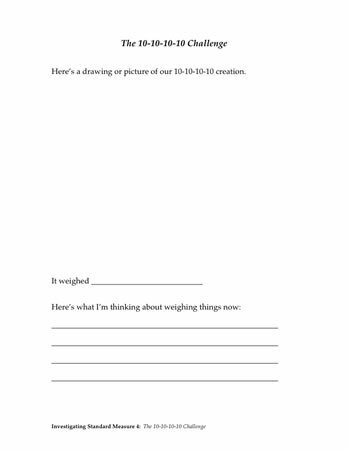 This final weigh–in can be a wonderful experience that involves careful measurement and lots of student engagement. Students return to their notebooks to describe how they’ve met the challenge. The 4 materials had the same weight but each material took up a different amount of space. When a 10g sample of a material was reshaped, the weight didn’t change. The combined weight (the completed object) equaled the sum of the individual weights. What did you discover about weight as you did the 10-10-10-10 challenge? Can students extend this last concept for everyday objects? For example, what can they say about the weight of a wood–handled hammer [the weight of the steel plus the weight of the wood will equal the weight of the whole hammer], or steel scissors with plastic handles, or a pair of metal–rimmed eyeglasses? If possible, leave the objects in a gallery space for reference during the next set of investigations on volume.